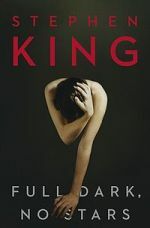 Full Dark, No Stars is Stephen King’s latest collection of stories, but unlike previous anthologies this one consists of novellas instead of short stories. “1922” is about the fate of a Nebraska farmer who kills his wife and tangles his star-crossed, teenage son up in the consequences. “Big Driver” is a lot like if Stephen King wrote a Lifetime Movie of the Week script: female author on a road trip is waylaid, sexually assaulted, left for dead, then has to wrestle with how to deal with her shame and rage. “Fair Extension” offers a disturbing answer to the age old question of why bad things happen to good people, while “A Good Marriage” examines what might happend when a wife discovers that her husband of 27 years is secretly a serial killer. Relative to King’s last collection, Just After Sunset, I liked Full Dark a lot more. My favorite of the novellas is “Big Driver,” which I hated at first because it felt like King was basing his character’s inner dialog on pamphlets swiped from the local battered women’s shelter. It just felt stilted and cliche. But not long into the story, things take an interesting turn and it starts to read more like what you’d get if the lead character from one of those “bloodless murder mysteries” that so captivate little old ladies were to find herself trying to solve a brutal crime where she was not only the victim, but the artiber of justice. I also liked “1922” for its skillful use of an unreliable narrator and the way King toys with us by leaving clues about how reality might have diverged from this character’s confession. As I went through each of the 4 novellas, I kept thinking that the theme tying them all together was that of people being forced (or at least strongly nudged) into bad situations by the events around them. Most of these stories exhibit excellent plotting on King’s part –you can see the characters ponder their next act or their next decision, and you can see the forces at play. Tess wants to go to the police about her attacker, but she fears the shame and damage to her career. Darcy wants to turn her serial murdering husband in, but she doesn’t want to leave an indelible stain on the lives of their children. Wilfred wants to acquiese to his son’s demands to sell their land, but he doesn’t want it going to buyers who will turn it into a polluting slaughterhouse. All this is done in a way that doesn’t make the author’s hand apparent in dictating the plot; the characters’ actions seem believable and understandable, if not conscionable, because their reasons ARE part of their characters. And indeed, I was happy to hear King mention in the author’s Afterword that this is exactly the effect he set out to create, even if he also identified the collection’s theme as “retribution” (which, in hindsight, makes total sense). So, while this is not traditional King (there’s nary a supernatural element to any of these stories that can’t be explained away) it’s still pretty good writing in the thriller vein. King fans should check it out.